We have built nearly 100 homes locally, and funded more than 150 homes internationally, impacting 318 families in the last 30 years. At $145,000 per house, St. Vrain Habitat has maintained the lowest cost-of-construction for a single family home among all local housing developers, both commercial and non-profit. St. Vrain Habitat offers affordable mortgage loans, and all loan payments help us build more Habitat homes. The St. Vrain Valley is blessed with people who have huge hearts and are willing to donate their time and talents to help others realize the dream of home ownership. Volunteers founded and worked diligently to build Habitat into the organization that it has become. Today, volunteers lead construction groups, participate in the family selection process, give their time and expertise in finance or law to help guide growth and development of the organization, and/or help our ReStore run smoothly. Dedicated volunteers, from the Board of Directors to construction crew on a job site to sales floor helpers in the ReStore to administrative assistants in the office, are the backbone of St. Vrain Habitat. Without volunteers, St. Vrain Habitat simply could not exist. None of this would be possible without the funding given by the local community. Monetary funding is provided by dedicated corporate and faith-based organizations, foundations, as well as generous individuals in the St. Vrain Valley. Habitat for Humanity International does not fund the work in the St. Vrain Valley, though they partner with our local affiliate. (Habitat for Humanity International does administer national corporate and in-kind support partnerships which Habitat affiliates throughout the country.) The St. Vrain Valley community changes the lives of families living here and abroad. Learn how you can support our local affiliate, Habitat for Humanity of the St. Vrain Valley. Featured above: Some of St. Vrain Habitat's staff and board members were joined by staff from the Habitat for Humanity Paraguay affiliate for a learning lunch in May 2018. St. Vrain Habitat staff truly understand the mission of Habitat. They understand growth represents another child who will have a safe place to do homework or invite friends over or another St. Vrain family who will be able to have holiday meals at their own kitchen table and not at the local shelter. 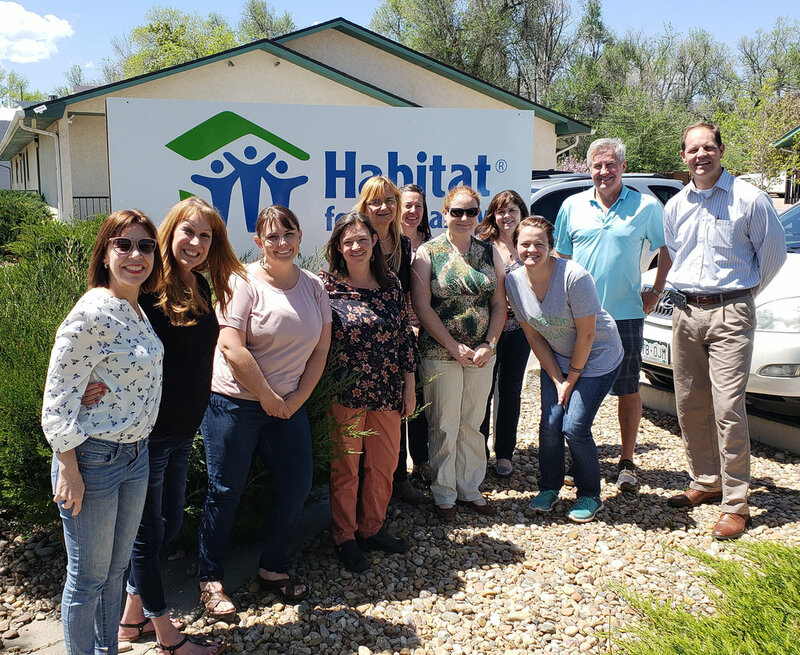 By bringing diverse skill sets to the organization, the team collaborates to ensure St. Vrain Habitat continues to increase the number of families served. Working together, they develop new programs to educate the community, identify areas of opportunity and reach out to affiliates abroad to further extend St. Vrain Habitat's impact. Some individuals and companies provide goods or professional services. In-kind donations are invaluable to St. Vrain Habitat’s efforts to build decent, affordable homes. Pro-bono labor and donated construction materials allow Habitat to build more homes in a shorter amount of time, and reduces the cost of construction. With about one-third of construction costs covered by donated materials and skilled labor, Habitat can build one extra home per year. To discuss a donation of services, please contact Stephen Scott, Director of Construction, 303-682-2485. For ReStore donations, click here.